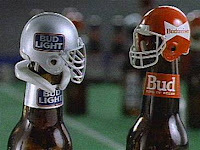 Every Super Bowl Sunday, a flurry of drunks will ask this question: "Who the heck won the Bud Bowl?" Arguably the most famous ad campaign in Super Bowl history, the Bud Bowl has not existed since 1997. There were eight Bud Bowls in all, which ran successively from 1989 to '97 with the exception of 1996. Bud has a 6-2 record against Bud Light in the Bud Bowls. The Bud Bowl was clever the first year, then recycled the same old material during seven other Super Bowls. Most became bored and tired with it, and now I think it's been so far removed, a Bud Bowl commercial or two could work - maybe. On Deadspin last week, one of the creative forces behind the first Bud Bowl was interviewed. The most interesting fact from that interview was that the animators from "Pee Wee's Playhouse" actually created the Bud Bowl. Pee Wee's animators did a lot of cool touches, such as a fan (a beer bottle) with the sign "John 3:16" and hippie fans, that were missing in later Bud Bowls. And it wasn't overly easy to produce these commercials. The bottles had to be moved by hand for stop-motion photography, and it took the animators eight hours to create footage for three seconds. Last year, the Super Bowl commercials were universally considered a letdown, and a bad economy was to blame. Apparently, there was not enough money to come up with original ideas. 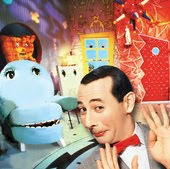 Perhaps Pee Wee's crew should be contacted.